DC Public Library wants to better understand how we can meet the changing needs of D.C. residents. Through our strategic planning process, we hope to respond to the evolving ways people access and process information in the 21st Century, while preserving so many of the vital resources and timeless services our users have come to count on. 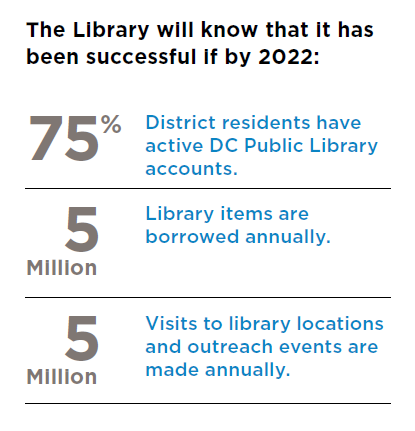 The strategic plan, informed by the broader D.C. community, will serve as a roadmap for the library in the coming years. It will help guide the Library Board and Staff in planning and decision-making for future library services. For citywide and branch level information about the library system’s usage and the city’s many diverse communities, please view our interactive map. a love of reading. The Library will provide services and programs that build and cultivate literacy and a love of reading. Prepare residents for life online. Support digital citizenship by providing technology, internet access, and training. Ensure neighborhood libraries are vital centers of community learning and civic engagement. Strengthen communities through services, programs, outreach and increased use of the Library’s physical campus. Foster understanding and appreciation of what makes D.C. unique. Learn more about the Strategic Planning Process. If you have questions about the DC Public Library strategic planning process, please contact Judi Greenberg, Director of Strategic Planning, at judi.greenberg@dc.gov.